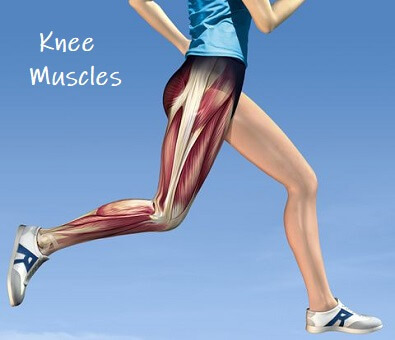 Our knee muscles are responsible for initiating and controlling movement of the knee and the kneecap. They also work work with the various buttock, thigh and calf muscles to help control the hip and foot. When we think about knee muscles, the ones that usually spring to mind are the quadriceps, found on the front of the thigh, and the hamstrings, found at the back of the thigh. How Do The Knee Muscles Work? The hamstrings and quadriceps work together, one contracting (agonist) while the other relaxes (antagonist) to allow the knee to bend and straighten. There are also other muscles that work with the quads and the hamstrings, that are just as important to help protect the knee, most notably the glutes and calf muscles. Knee muscles need to have both good strength and flexibility. Any tightness or weakness makes you prone to a whole host of knee problems. Here we look at each of the muscles of the knee, how they work, what can go wrong and how to prevent knee muscle injuries. Common Problems: tightness, weakness, muscle tear, tendonitis. 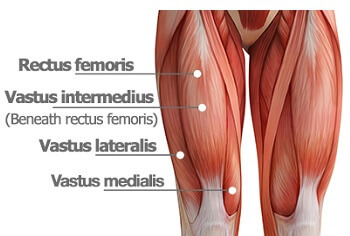 The quadriceps are a group of four muscles found in the front of the thigh and over the knee. Their primary role is to straighten the leg. 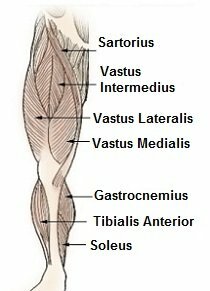 The four muscles, vastus medialis, vastus intermedius, vastus lateralis and rectus femoris, each originate from the top of the femur (thigh bone). They pass down the front of the thigh and then join together near the knee to form the quadriceps tendon. The quads tendon flows around the patella (kneecap) before finally attaching to the tibial tuberosity at the front of the shin bone, by which time it is known as the patellar tendon. What Do the Quads Do? 3)	Work with the glutes (bottom muscles) and hamstrings to supply the thrusting forces of walking, running and jumping. 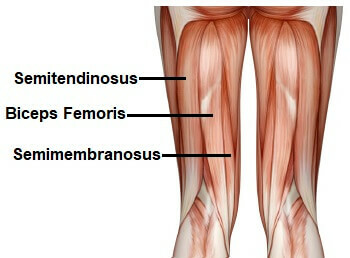 The hamstrings are made up of three muscles found in the back of the thigh. Their primary role is to bend the knee. Each of the three hamstrings muscles, semimembranosus, semitendinosus and biceps femoris, originate from the bottom of the pelvis, travel down the back of the thigh and attach to the back of the knee. There is a muscle behind the knee joint itself called popliteus which helps the knee to twist, aids stability of the knee and helps protect the lateral meniscus. 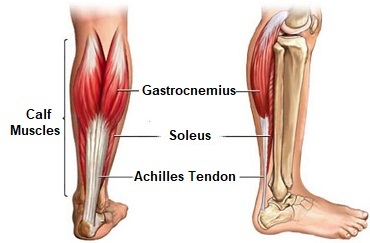 Just below the knee on the back of the shin are the calf muscles, soleus and gastrocnemius. The calf muscles mainly control foot and ankle movement but the do also play a small part in knee movements. Weakness in the calf muscles can often lead to knee pain too. Another group of muscles not to be overlooked with knee problems is the glutes, or buttock muscles, gluteus maximus, gluteus medius and gluteus minimus. The glutes play a very important role in the stability of the knee and in my experience, almost everyone suffering from ongoing knee pain has weak glutes. Can Muscle Problems Cause Pain? Yes! Tightness or weakness in the quadricep and hamstring muscles are often part of the cause of knee pain. If there is muscle imbalance, it changes the way the forces go through the knee, and puts extra pressure on certain areas, leading to knee pain. Knee stretches and strengthening exercises for the knee muscles help relieve knee pain in virtually every condition - click on the links to find out more. If you want to know more about the individual muscles, use the relevant links above.